I can't understand why people are moaning about this release. I have 6 of the analord records at the moment and backdoor.netshadow instantly became one of my favourite tracks out of the lot of them! Why did I sell my copy of this?! Fantastic entry in the Analord series. One day.... it will be mine again. This is a surprisingly sterile entry in the otherwise superb Analord series. While Analord 03 recycled drum samples to a degree, the melodies were strong enough to make it worthy of purchase. However, this entry recycles drums to an even greater extent. Case in point: the drums on both tracks on side A are exactly the same. Oh, wait, something worse: all four tracks on this EP run at the same speed. Also, W32.Aphex@mm recycles the melody that comes in partway through Trojan.KillAV.E. This album sounds like an uncreative attempt to do rave music. All in all, it's sort of okay on its own, but awful in comparison to the rest of the series. Only worth picking up if you're a completist. 'mydoom' is also part of the 'W32.Mydoom.AU@mm' title on Analord 11. 'Mydoom' is a computer worm which affects Microsoft Windows (the fastest spreading email worm ever). With reference to the track title 'Backdoor.netshadow', in computer terms 'backdoor' is a method of bypassing normal authentication or securing remote access to a computer. 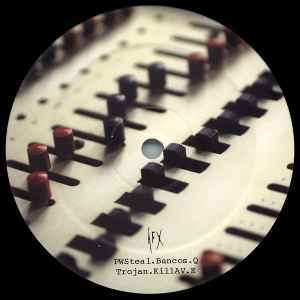 Regards the track title 'Trojan.KillAV.E', in computer terms, a 'Trojan' or 'Trojan Horse' is an otherwise innocent looking computer program which contains 'backdoor' functions as described above. Unsuspecting victims of a Trojan will be unaware of its activities e.g. file deletion, configuration alteration etc. More info about these computer terms can be found on the Wikipedia website. This is perhaps my favorite Analord. The dark rave feel and the incredible way that RDJ takes control of his synths and shows off their full flexibility is amazing. Just listen to the stereo effects and filtering throughout Backdoor.Netshadow and you'll see what I mean.